These are tough economic times, and drastic times call for drastic measures. First of all, how about cutting that 20 mile round trip commute that you take to work down to a 4 mile (or closer) round trip commute? Second of all, how would you like to take that monthly rent that you are paying or that incredible mortgage that you have and trade it for a home that can cost you hundreds less per month? Oh, the joys of saving money! If you’ve been following this blog, we’ve pointed out some of the outstanding schools, people, businesses, and developments that exist right here in West Jackson. We’d like to share all of this West Jackson goodness with you as our new neighbor. There is definitely a buzz happening about the bright future of the west side of town. We’re not surprised because the sun comes home to us every day (get it, sun sets in the west). Anyway, corny joke aside, the vibrancy and revival of downtown is on a sure trajectory to the west. No, we don’t necessarily expect high rise buildings to pop up everywhere, but we do expect different types of developments that provide the same energy and enthusiasm that the newest downtown developments have brought to the heart of the city. With that said, you are invited to be a part of this resurgence of West Jackson. On Saturday, November 13, at 9:30 a.m., you can participate in an event in which you can learn about available lending programs that can assist you with purchasing a home AND renovating the home with one mortgage. You’ll also have an opportunity to take a free trolley tour so that you can see the possibilities (and hopefully yourself) in one of our West Jackson neighborhoods. This program is also available to those who are seeking to make aesthetic and energy efficient improvements to the home in which they currently live. So if you are a homeowner looking for options to renovate your existing home, this program is for you as well. If you are interested in attending, please RSVP to 601.979.2255. We look forward to seeing you then! Also make sure to read the Fixin’ to Stay post for more information on the 203K program. This event is presented by Bo Smith of Cornerstone Home Lending, Inc. Bo Smith is licensed by the Mississippi Department of Banking and Consumer Finance (NMLS 92100). This is not a commitment to lend as borrower must meet qualification criteria. Supporting sponsors for this event include Atmos Energy, JSU Center for University-Based Development, Leah Cim Real Estate & Property Management, and Wright Concepts. 1 Comment on All Aboard! 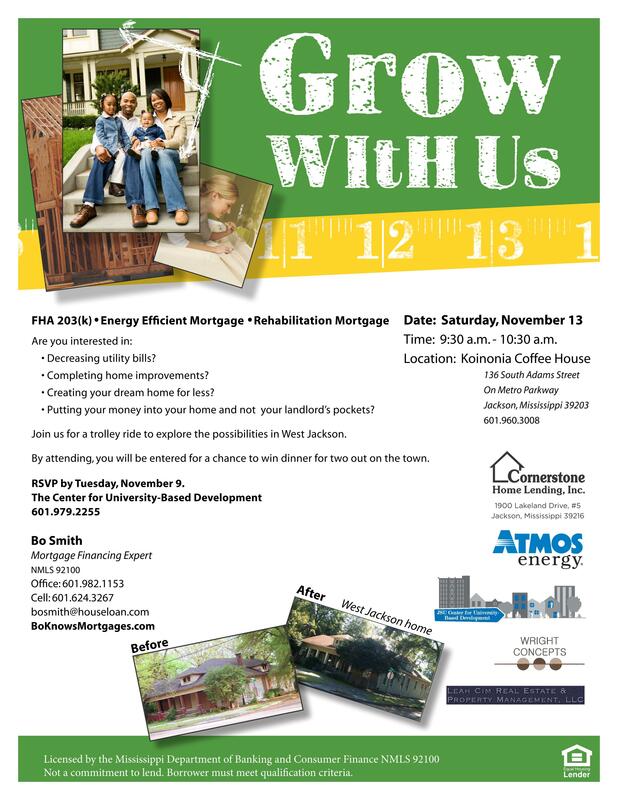 Come join us and realize how you can make a house a home with a FHA 203k and/or Energy Efficient Mortgage. Learn how you can transform the house of your dreams into exactly what you have seen on TV. Grow with US, and revitalize!